The Yankees caught me off guard in 2016. It’s not that they didn’t have any unusual Yankee Stadium food options in the past, but they hadn’t yet offered some of those extreme Man vs. Food types of challenges like the Bacon Challenge in Cincinnati or the Wayback Triple Triple in Philly. But recently, Yankee Stadium has become the destination for eaters who love a challenge. 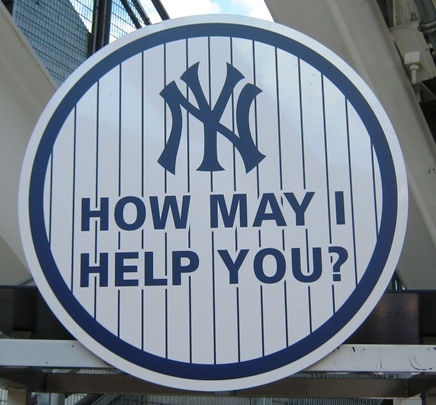 Or at least like to share, as the Yankees like to advertise it. This being New York, the Yankees are required to show the staggering calorie counts, which makes their latest food additions that much more impressive. This is why we don’t use the metric system. 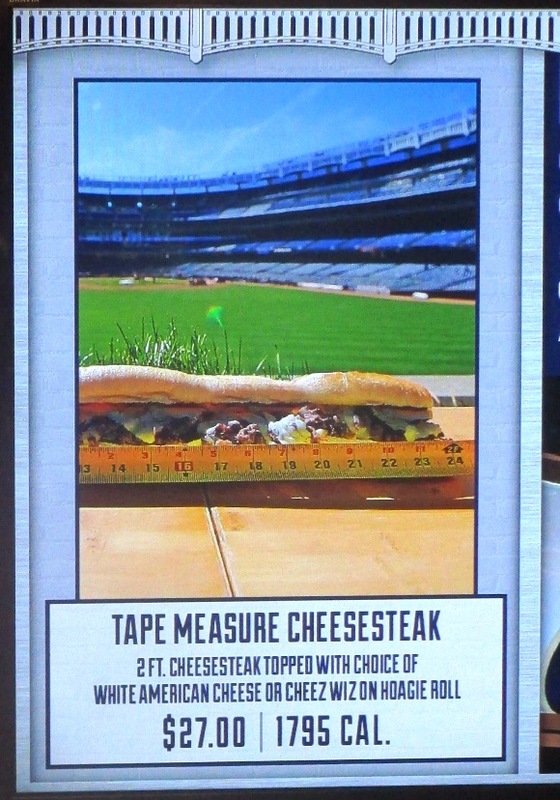 BIG Yankee Stadium Food Options, Tip #1: The Tape Measure Cheesesteak. Jersey Mike’s replaced Carl’s Cheesesteaks in Yankee Stadium, but they still serve Philly-style cheesesteaks with onions, peppers and the ubiquitous Cheez Whiz if you’re looking for Philly authenticity. I’ve had one before and was perfectly happy with it, even being a Philly native. The Tape Measure is a two-foot monster that clocks in at 1,795 calories; it’s “perfect for sharing” as the Yankees and Jersey Mike’s say. It may be, but one wonders why people wouldn’t just buy two of them. It’s not like you’re saving much money here. Personally I might be willing to take this on myself, but I don’t know if I could handle that much Cheez Whiz in one sitting. Think I might go for the American cheese with that. 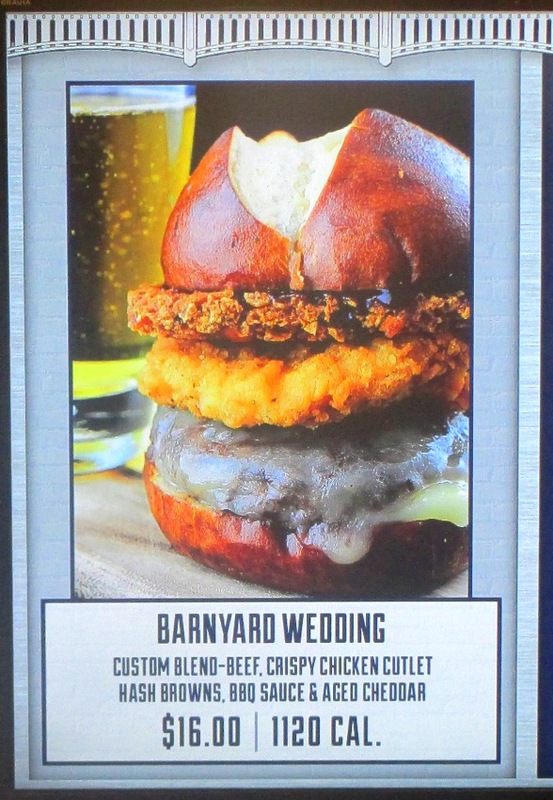 BIG Yankee Stadium Food Options, Tip #2: The Barnyard Wedding. Cute name for a sandwich that includes “custom-blend” beef with a fried chicken cutlet. Can’t imagine what the children will look like. Oh, and don’t forget the hash brown too, with aged cheddar and BBQ sauce mixed in. Greg Kirkland of Pinstripe Alley wrote an in-depth piece about his experience taking on the Barnyard Wedding. I am fairly certain he is correct when he describes it as a delicious and unhealthy monstrosity worth trying once. You might want to balance this one with some roughage. As you can see though, not too bad on the calorie meter. That’s not much more than a Double Whopper with bacon and cheese. In a Stadium with few goats in its history. 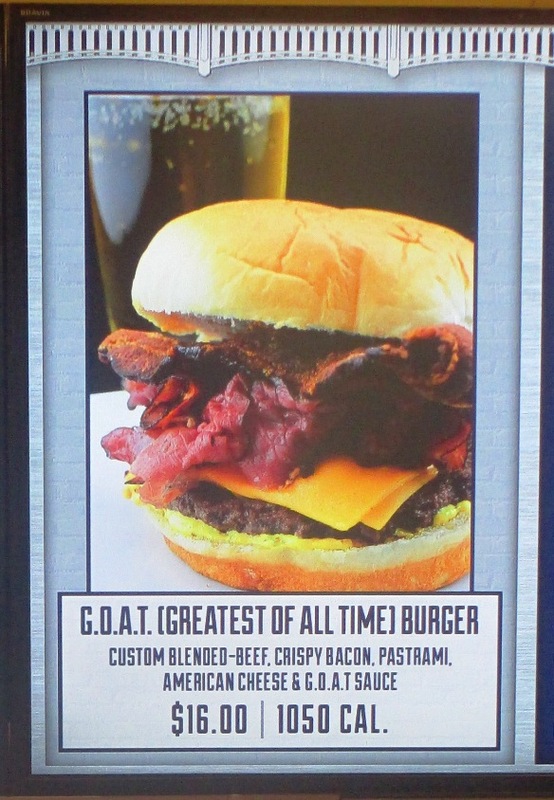 BIG Yankee Stadium Food Options, Tip #3: The G.O.A.T. Burger. The “Greatest Of All Time” burger brings in pork products New York-style along with the burger. It’s patty of custom-blended beef (like any burger should be), and topped with bacon (SOLD! ), pastrami (SOLD AGAIN! ), American cheese and something called G.O.A.T. sauce. I haven’t tried it, and I don’t yet know what the G.O.A.T. sauce is, but it’s yellow so I’m guessing it’s some sort of mustard or mayo. The G.O.A.T. is actually almost a diet option at least as new Yankees sandwiches go: it’s “only” 1,050 calories. I wonder if you can get it without the sauce. This one is also at the Triple Play Grill…I’m refraining from heart-related jokes. That’s three totally insane additions of food at Yankee Stadium as of 2016. Personally, I’m not sure if these sandwiches will last more than a year or two…I can’t imagine any of them being consistently big sellers. They’re still listed on the menu as of 2018. But that’s just me…and I hope I’m wrong.